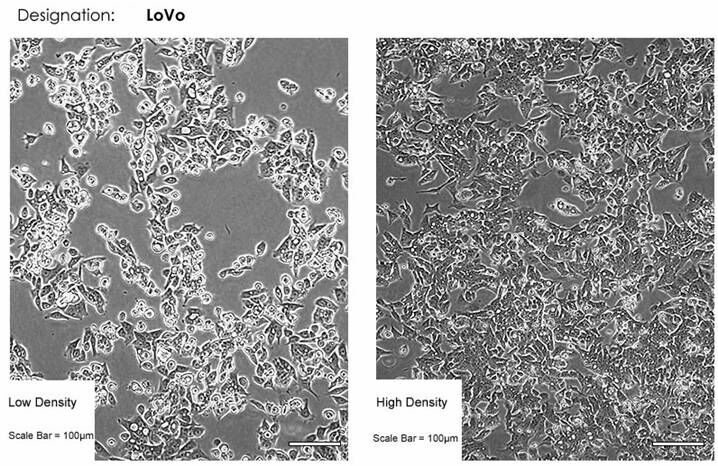 Applications:This cell line is suitable as a transfection host. The stemline chromosome number is hyperdiploid with the 2S component occurring at about 2.7% and 3 marker chromosomes were common to all S metaphases. Karyotypes were generally homogeneous and stable. The base medium for this cell line is F-12K Medium. To make the complete growth medium, add the following components to the base medium: fetal bovine serum to a final concentration of 10%. Volumes are given for a 75 cm2 flask. proportionally reduce or increase amount of dissociation medium for culture vessels of other sizes. 1. Remove and discard culture medium. 2. Briefly rinse the cell layer with 0.25% (w/v) Trypsin- 0.53 mM EDTA solution to remove all traces of serum which contains trypsin inhibitor. 3. Add 2.0 to 3.0 mL of Trypsin-EDTA solution to flask and observe cells under an inverted microscope until cell layer is dispersed (usually within 5 to 15 minutes). 4. Add 6.0 to 8.0 mL of complete growth medium and aspirate cells by gently pipetting. 5. Add appropriate aliquots of the cell suspension to new culture vessels. 6. Incubate cultures at 37°C.